On Parking Day 2017, anonymous group plants plungers on South Street Bridge to replace destroyed bike lane flex posts. Safer Streets PHL, the anonymous group of Philly cyclists behind last month's Center City plunger protest, got back to business last Friday with another deployment along the South Street Bridge. Determined to protect the integrity of Philadelphia's emerging protected bike lanes, the urbanist advocacy group chose the occasion of international Parking Day to send another message on Friday. Typically, Parking Day is a time for artists around the world to transform metered parking spaces into temporary public spaces. 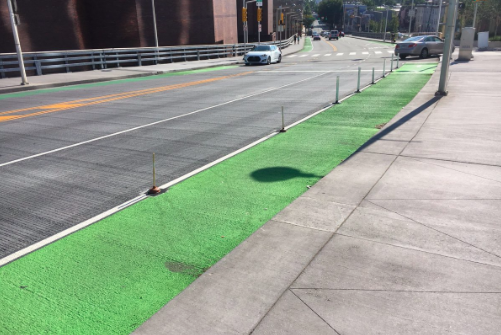 In this case, Safer Streets PHL went to work at the South Street Bridge to draw attention to three damaged flex posts in the bike lane. The plungers stood largely undisturbed for a full day. In late August, Safer Streets PHL placed 50 plungers along 22nd Street from South to Spruce Streets, releasing a statement to explain their mission. "For too long, Philadelphia's most traveled bike routes have left cyclists vulnerable to people driving motor vehicles carelessly and aggressively," the statement said. "Bike lanes need to be as safe as possible, and Safer Streets PHL is committed to showing the people of Philadelphia how it can be done." In August, a long stretch of Chestnut Street between 45th and 34th Streets received the city's first one-way protected bike lane. The project sparked some controversy after City Councilwoman Jannie Blackwell suggested the installation could be temporary, but a city spokesman quickly confirmed it's "not a trial or a pilot." Neither are these missions from Safer Streets PHL. The group told PhillyVoice they have plans in the works for future interventions, but details remain under wraps for the time being. One thing that might change? The plungers. Next time around, don't let your eyes be deceived if you see pool noodles show up on the streets of Philadelphia.